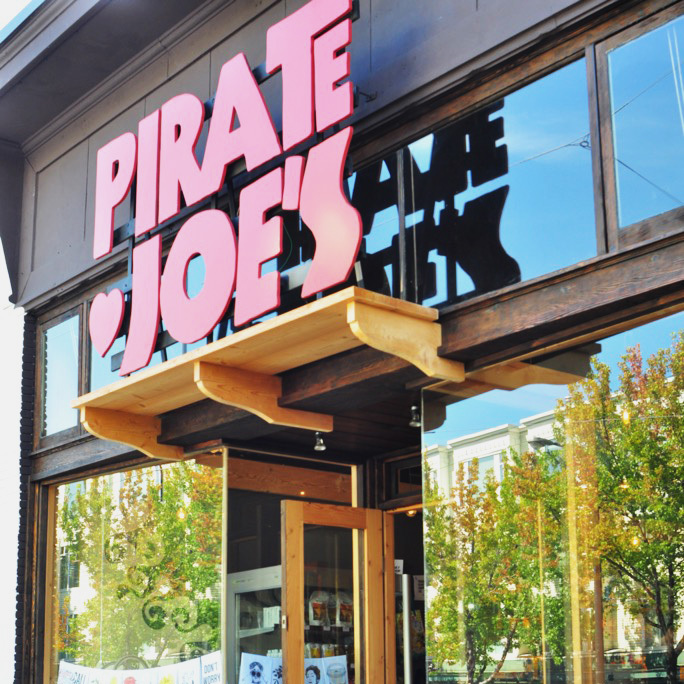 The legal battle over Pirate Joe’s – a shop in Vancouver that buys Trader Joe’s products in the US and then resells them at higher prices to eager customers in Canada where Trader Joe’s doesn’t operate any stores – is back on. And owner Mike Hallatt is ready, practically even enthusiastic, for the fight. Since opening Pirate Joe’s back in 2012, Hallatt has bought over a million dollars’ worth of Trader Joe’s products to be sold in Canada. (He says he’s even saved the receipts.) He has operated in a space economists refer to as a grey market—legally selling (or in this case reselling) items through channels not intended by manufacturers. TJ’s has not taken kindly to Hallatt’s plans and repeatedly faced off against the former San Franciscan who fell in love with Trader Joe’s while living in the Bay Area. First, Trader Joe’s sent Hallatt a simple cease and desist letter, saying the company doesn’t want him reselling its products and asking him to shut down his store. Trusting in the legality of his business model based on the opinion of multiple lawyers, Hallatt tried reaching out to the retailer and was met with, as he described it, “radio silence.” In 2013, Hallatt was hit with an actual lawsuit, which was dismissed by a district court the same year, with the judge essentially ruling that the whole thing was a Canadian issue that didn’t affect Trader Joe’s business in the US, thus putting it out of the court’s jurisdiction. If that’s true, last week things reached their silliest point yet when the 9th US Circuit Court of Appeals overturned the previous dismissal with Circuit Judge Morgan Christen ruling that, despite operating in Canada, Hallatt’s store could theoretically decrease the value of the Trader Joe’s trademarked name in America. The decision means that the case will be sent back to the district court for, as Hallatt describes it, “a full blown trial.” During our talk, he didn’t even sound angry so much as looking forward to hopefully finally getting some closure on this now three year battle. “Good for them. Okay fine. They did it,” he said somewhat wryly. He hopes now is his chance to establish a new legal precedent. “The lawyers were all really fascinated because it turns on this very narrow question ultimately … that is if I buy the stuff retail and throw it in my van and drive it up the highway, am I damaging the product by doing so,” Hallatt explains. According to Hallatt, Trader Joe’s entire argument hinges on the idea that the items he’s reselling can damage the Trader Joe’s brand by being of lesser quality or – even worse – by possibly giving someone food poisoning, an allegation Hallatt said Trader Joe’s has tried to make. For the record, Hallatt maintains that his products have never made anyone sick, and he’s surprised it’s an issue Trader Joe’s wants to get into since his lawyers will be able to ask about the company’s recent recalls and food poisoning statistics during the trial. “I don’t know what they’re thinking,” he added. In the end, Hallatt, who has been lucky enough to have his legal fees covered for him by an auspicious insurance policy, wants to fight this battle not just as a legal precedent for little resellers everywhere, but for fans of his store. “Every morning, I wake up and I go, ‘I really want to quit. Goddamn is this hard,’” he said. But when he gets back into the store, his excitement returns. “[People say] ‘This store’s so cool. I love Trader Joe’s,’” he told me.